1. Allow each iCloud-synced device to designate a different folder as the bookmarks bar folder. I have 3 computers, an iPad, and an iPhone. Each serves a different purpose: on my work computer I’d like a work-related bookmarks bar, on my entertainment-center computer (hooked up to my TV) I’d like a bookmarks bar with shows & stuff, on my home laptop I’d like links to shopping & blogs, on my iPad I’d want social sites & games, and on my iPhone (though it doesn’t have a bar) I’d like easy access to navigation & weather & restaurant-related links. But sometimes, the symbol you want is just not there, like a shopping cart/bag or the common social media icon ( ) for which I just substituted a facebook-like “f” character: ( f ). If you are using emoji to save space in your bookmarks bar, they are very small, so it would be nice if you could make the bar just a tad thicker. And no matter what you do, you cannot change the font size of anything on the bookmarks bar to match the size of the top-sites or sidebar icons (see my bookmarks bar image above). 4. Allow the user to change the behavior of the “+” button next to the URL. 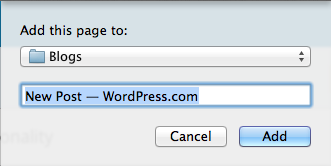 “Add URL to the bookmarks bar” is never what I want to do. I personally always want to name the bookmark myself, so I’d rather it caused the “Add Bookmark” sheet to come down so I could name it and put it exactly where I want it. So give the user the option to define how it works or at least switch it with another button, such as the share button. The bookmarks and reader links in the sidebar look slick, but editing & rearranging your bookmarks in the sidebar is so clunky and awkward. 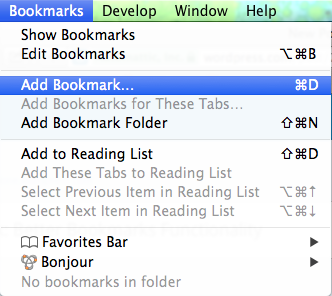 It’s much easier to do using Bookmarks->Edit Bookmarks menu item. You can create a bookmarks bar link to that interface by dragging the “bookmarks://” URL to the bookmarks bar, but that sidebar icon is still taking up prime real estate there on the left of the bookmarks bar. At least allow us to change its behavior to bring up the “edit bookmarks” interface. I use top-sites a lot and sometimes, I add a top site that I have not also bookmarked and when I’m on another device, I realize that I don’t have a way to get to the site I was on before. Likewise, it would be nice if the history was synced too so that I can get back to a site I was reading on a different device. The history could be divided up by device – not necessarily merged into a single history. The devices could be listed in the History menu and under the “Show History” button in the toolbar. I am one of those old-school browser guys who never uses tabs. In my preferences, I have “Open pages in tabs instead of windows” set to “Never”. I would say that if you have this setting, you should get rid of that new-tab icon in the bookmarks bar. There are lots of plugins and other utilities out there that might already do some of these things, but these all seem like common sense functions that would make bookmarks easier to use and manage.